Ashley and Adam got married in Colorado this past September and chose our New Zealand PASSPORT program for their honeymoon. We chose Wanaka, New Zealand as our home base for for their session. The day before Ashley & Adam’s shoot, I drove out to where I planned on photographing their ‘engagement’ session. Unfortunately, I drove the hour and a half down this dirt road and about 5 miles before the location I wanted to shoot at, the road was closed due to flooding. I tested the flooded area to see if we could drive across. That was a no go. The area was too deep and large rocks were hidden in the water. Plan B. I remembered a location I drove by on the way to Wanaka. It was large rolling hills, and it looked absolutely beautiful. A location I really wanted to visit. 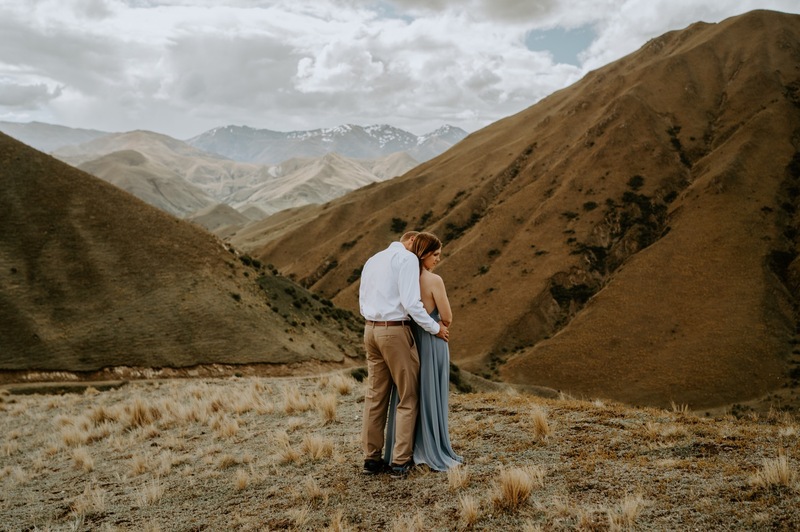 The day of Ashley & Adam’s session, I met them at their AirBnb in Wanaka and we made the drive up to Lake Hawea. There is an inlet in the water where we could walk down and enjoy the views of the mountains with the lake. From the lake, we drove further up the pass and stopped at a little “trail” I saw as I drove by the day before. We would have to cross private property with sheep by our sides, but the green rolling hills and the views of the mountains ahead, made for a perfect backdrop. To finalize our day, the three of us drove outside of Wanaka to those brown rolling hills that I remembered. We hiked out, got hailed on, climbed the hills and captured some truly beautiful images. Thank you again, Ashley & Adam for coming all the way to New Zealand. Thank you for an adventure, it was amazing!